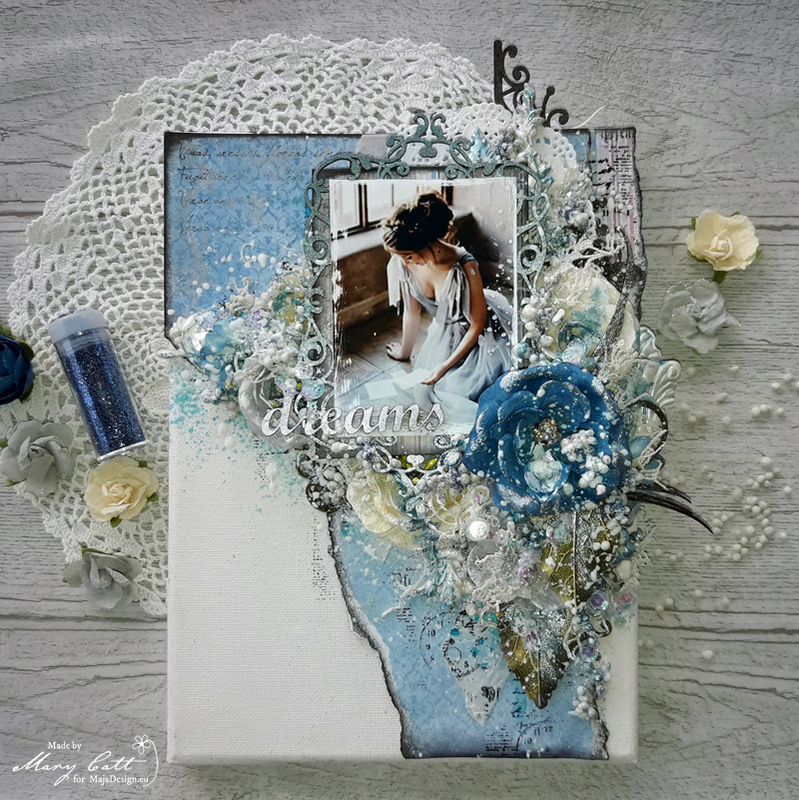 Mary here with you today and I have a new canvas to share for my July inspiration. 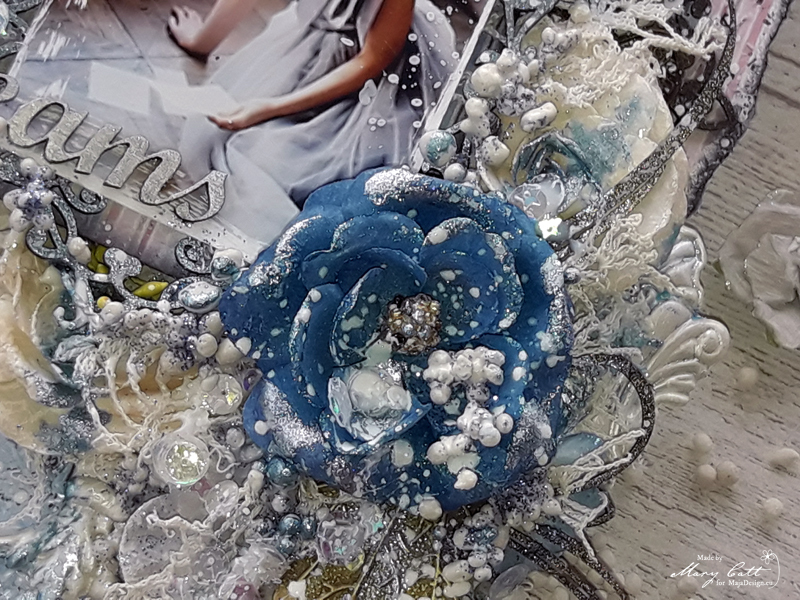 A soft romantic canvas on the shades of blue and beige with lots of flowers, chipboards and IOD moulds. As you may already know, I love searching on Pinterest to find photos to scrap and this time I came across with that photo. 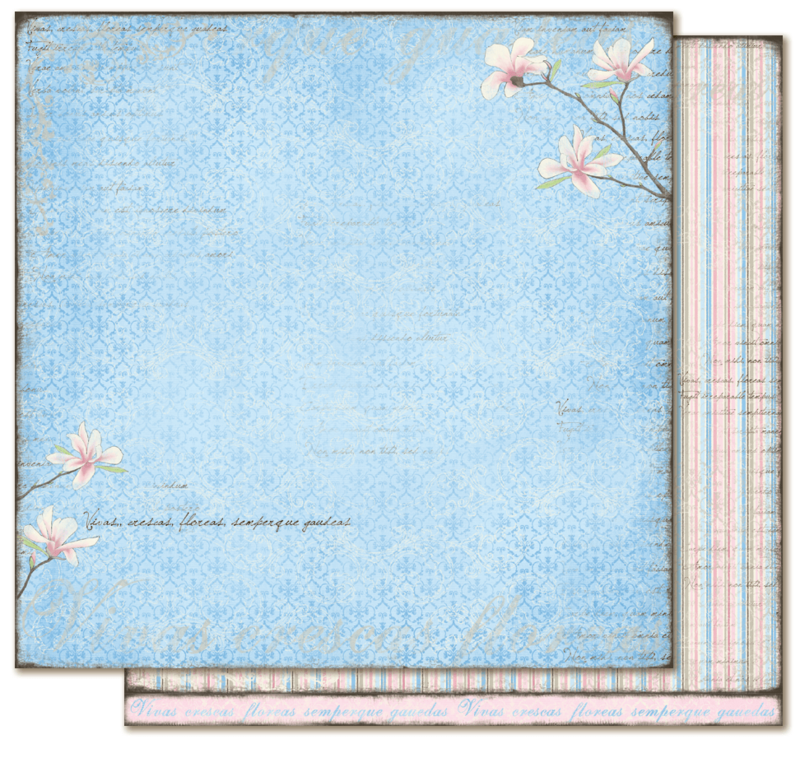 And, the beautiful papers from the ”Crea Diem” collection was just perfect for it. But, before I continue more I want to give all the proper credits to the ”unknown” photographer. I used the ”Må du leva och växa” paper for the ”Crea Diem” collection. To start, I glued down the papers and I applied a coat of clear gesso. When it was dried, I added some texture with modeling paste and a stencil. I made some random stamping and then I used a Lindy’s Gang spray to color my page. I colored the ”Doodads #6” and the ”Iron Garnish #6” chipboard with the Raven Black sparks acrylic paint. 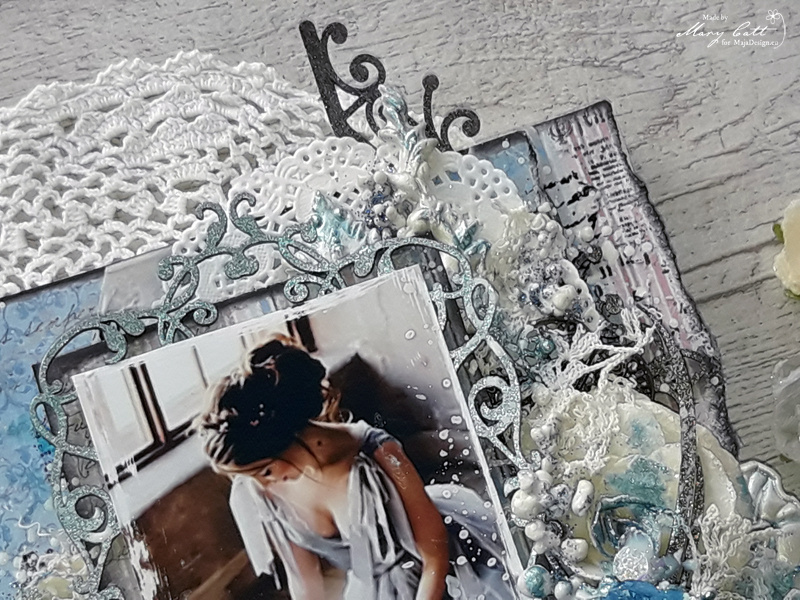 The ”Delicate Frame #3” chipboard was also colored with the Magical Pond paint and the chipboard title with the White Pearl. 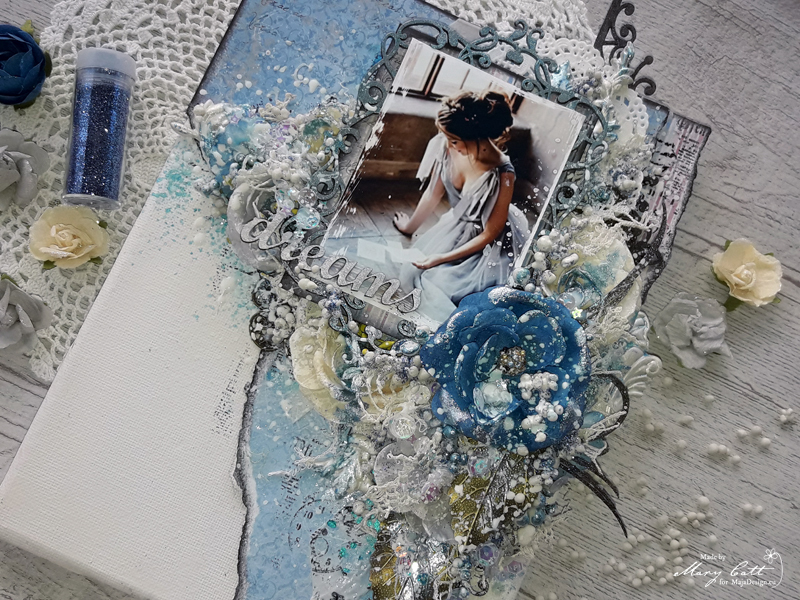 The chipboards I used are from Dusty Attic. 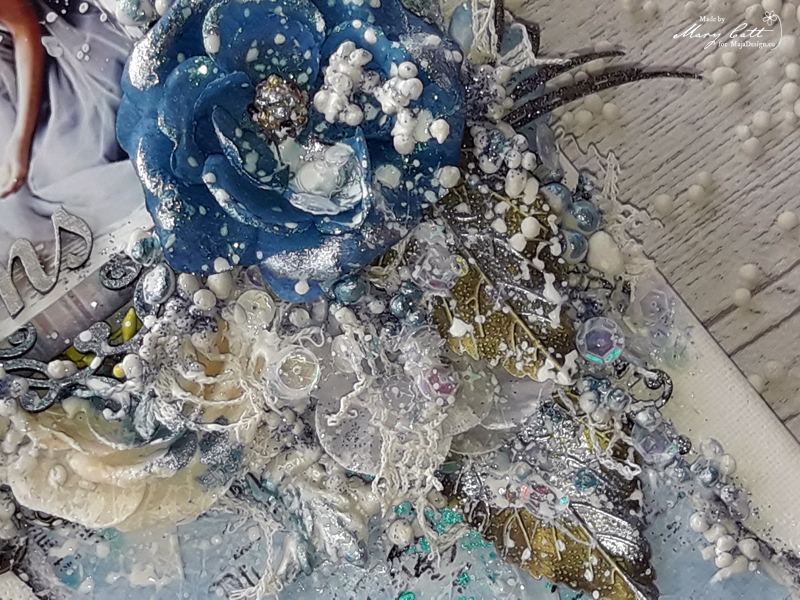 When everything was glued down, I added some art stones and I made the final touch with some splatters with white gesso diluted with some water. Oh my goodness! This is so sooo beautiful. I absolutely love, how you made this one, it looks stunning Mary, and in such gorgeous colors too. Truly amazing and gorgeous work, well done hun.